As it is every year, this Saturday's game between Georgia and South Carolina is getting a lot of hype. It also has huge postseason implications. If Georgia loses, they can give up any hopes of playing in the National Championship short of a miracle. For South Carolina to reach their dream of the SEC championship and then the National Championship, they cannot afford to lose a game at any point this year, much less in the second week of the season to a one loss team. Aaron Murray. While I will be the first to admit that Murray is a great quarterback, he has not shown up in many of the big games Georgia has played during his career. He consistently has made huge mental errors in these big games which has played a major role in the Gamecocks winning the matchup the last three years. (Well, that and a guy named Lattimore, but we all know that story!) 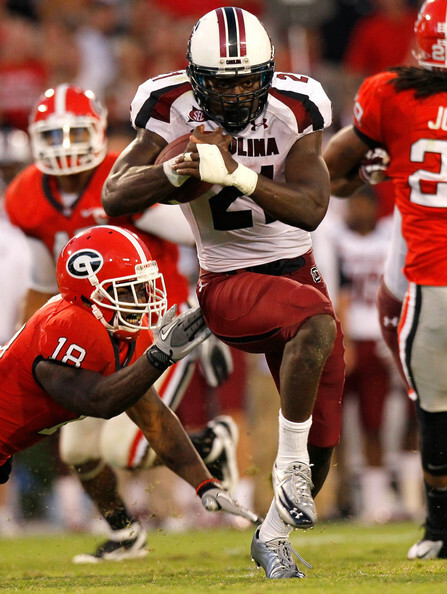 Despite his mental gaffes, Murray has a tremendous running back in Todd Gurley who could expose the young, rather inexperienced linebackers for South Carolina. He's a quick, versatile, powerful back who has a huge upside. He will be the key to Georgia's game plan after the loss of Malcolm Mitchell, to a torn ACL, for the season. Georgia's very young defense will have to find a way to slow down Carolina's offense and not allow their offense to get in an early hole. While they struggled against Clemson's fast-paced offense last week, they should be able to keep up a little better with the more methodical offense the Gamecocks run. If the Gamecocks are able to get them on their heels it could be a long night for the Bulldogs defensive front. Connor Shaw must play with authority this weekend in Athens. If he manages the game like he is capable of doing and doesn’t turn the ball over, the Gamecocks will come home with a 2-0 record and with their goals still intact. Last week the offense ran like a fine tuned machine for much of the game. The receivers were running great routes, and both Connor and Dylan Thompson were hitting their marks in stride. This will be even more critical this week against a tough defensive secondary. Mike Davis will need to find the holes in the defensive line created by their inexperience and the Gamecocks offensive line who is much improved. The Gamecocks will also get tight end Busta Anderson back from injury which will allow for more options for the offense in both blocking schemes and pass plays. I still think that Jadeveon Clowney is the best player in college football, and anyone who disagrees can come run wind sprints with him at Williams Brice on a typical summer day in Columbia. That being said, the rest of the defensive front, particularly Chaz Sutton, played lights out and proved that Clowney isn’t a one man show on defense. If they can find the holes and get pressure on Aaron Murray he will make mistakes and give the Gamecocks the upper hand. Aaron Murray will not be able to overcome his demons in the big game and will make too many mistakes for the Bulldogs to leave victorious. Jadeveon will shine in the national spotlight along with the rest of the Gamecock defense. My surprise player of the weekend will be Brandon Wilds, who came in late last week with some great runs at the end of the game. Look for him to break through in one of the biggest games the Gamecocks will play all year!